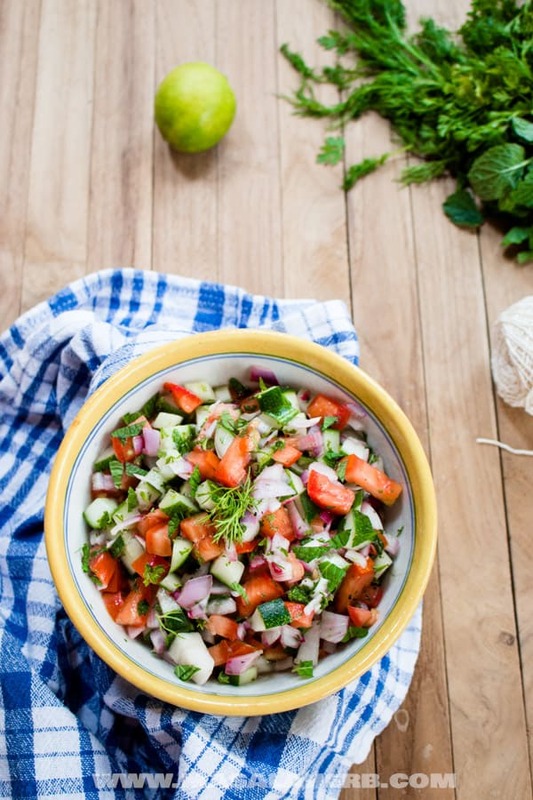 Shirazi Salad is a refreshing cucumber, tomato herb salad. It has its origins in the Persian cuisine. You can prepare this salad easily with these commonly available ingredients and, because I made it simple for you, you can serve the Shirazi salad with kebabs and similar dishes. Shirazi salad is named after the region, Shiraz, in Iran. 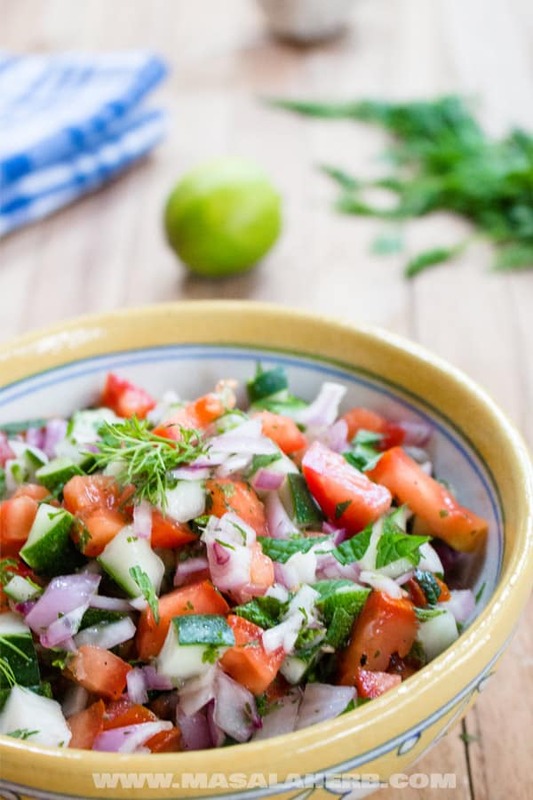 This particular Persian salad consists of seedless finely diced cucumbers, diced tomatoes, some onion and fresh herbs such as dill, mint, coriander, and parsley. The salad dressing is enhanced with a souring agent such as lemon, however in Iran something like unripe acidic grape juice (aka verjus) is used to marinate the salad. 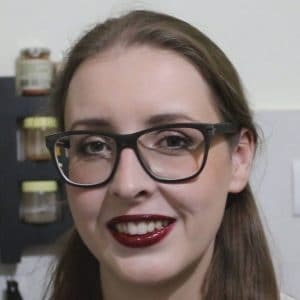 I don’ t know about you, but I don’ t always get grape vinegar, so I prefer to use regular vinegar or just simply lemon juice. It modifies the original flavor but does the trick too! The main concept of this salad is that the diced cucumber give some crunch to the salad and that the fresh herbs balance the flavors out. Shirazi salad is typically sour, salty and very refreshing. That is why Shirazi salad is usually prepared during the hot summer days, due to its refreshing properties. I see the Shirazi salad as a way to include a lot of fresh and healthy herbs! My favorite ingredients are definitely the peppermint, dill, parsley, and cilantro and they give the salad the character I am looking for when I crave middle eastern food. I got to know about Shirazi salad thanks to a Parsi (Irani) Zoroastrian acquaintance in India. It turns out India is full of various religions and believes and the Persian Zoroastrians in India are just another interesting minority. Unfortunately, I don’t know much about these people, except that their ancestors must have moved from the Persian kingdom to India and that they prepare great food, such as this Shirazi salad. I did gather over the years from various sources, that the great Moghul, who are ancestors of Genghis Khans and Timurid, and who ruled India for a few centuries, had a strong Persian connection. Babur, who was born in nowadays Kyrgyzstan took over the blue silk route city Samarkhand (neighboring Uzbekistan) from his uncle at a young age and a few years later he acquired the city of Kabul (Afghanistan) from his other uncle as well. At some point in time, he planned to take Northern parts of India and Pakistan on a raid across the Hindu Kush mountain range. Which he did. So, with his son Humayun, who became the lunatic opium-addicted lost and found Indian regent, later on, they won the battle of Panipat against the sultan of Delhi, Alaeddin. Apparently that’ s where they started to be called Moghul, which is a Persian word meaning ” Mongol/Mongolian descendants”. But how did the Persians get into the picture of India? The Mogul where Muslim Sufi believers. When they got the throat of the sultan of Delhi, they received the precious Koh-i-Noor diamond into their hands. Koh-i-Noor, by the way, is a Persian word meaning “mountain of light”. Apparently, one story goes like this, the Persians were (and still are) mainly Muslim Shia believers and back then tried to convert by helping the Mogul, to convert to Shiaism. This went on for a while where favors were given and Persians were sent to live amongst the native Indians and Moghuls in India. At some point, Humayun almost lost it all and gave the Kohi-noor to the ruler of the Persian world, who helped him back into power in Kabul and Delhi. 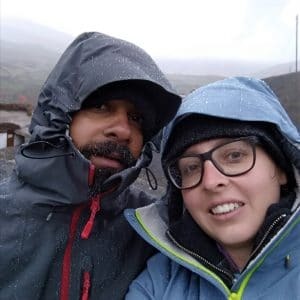 There was always a friendly connection, from what I read so far (except one Persian invasion in the 18th century), between the Persian kingdom and the Mogul kingdom of India, and trade was flourishing as well. This is how Indian Persians, who are better known as Parsi in India, came to be a minority in a country inhabited by over a billion people. The food can be found in some places in the cities such as in Bombay and I heard it’ s common in the northern state of Gujarat too. It consists of kebabs, pilaf, flatbread and Shirazi salad. It’s very similar to Mogul food! Fun fact: One of the most famous Parsi born Indians was the late Freddy Mercury from the British band the queen. Wash all your fresh salad ingredients and pat dry. Cut your Tomatoes into small dice. Don' t peel your cucumber just cut off the ends and scrape out the seeds if there are any. This depends on the cucumber variety. Best you use the dark green seedless English cucumber variety. Cut into small dice. 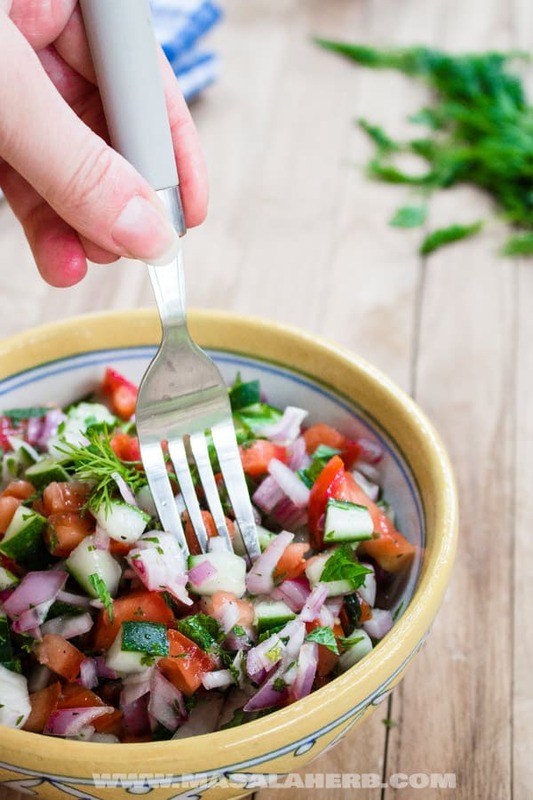 Chop your herbs small, mint, dill, parsley and cilantro and add to the diced tomato and cucumber. Mix all the ingredients for the dressing and pour over the salad ingredients. Mix and let sit for at least 30 minutes. The flavors will mingle together and the result will be a beautiful refreshing salad. Serve as a side with any meat dishes such as kebabs. Se further on top of serving suggestions. How to serve the Shirazi Salad? Shirazi Salad can be served with any middle eastern kebab. I tried it with Turkish kebabs and Israeli falafels and it worked well too due to the fact that the ingredients in these cuisines are similar. Shirazi salad reminds me of Israeli salad at times. Or you could serve Shirazi salad also with a steak, schnitzel, chicken and rice or any other lightly flavored dry meat dish. Another idea is to serve with pilaf rice and vegetable patties. Dear Reader, how did you get to know about Shirazi salad? Please let us know in a comment further below. We are always looking forward to reading your thoughts here. thanks for sharing …. keep sharing in future too. LOVING the flavors in this salad!! Such an interesting post! I know this as Israeli salad, but whatever you call it, it’s one of my favorites! 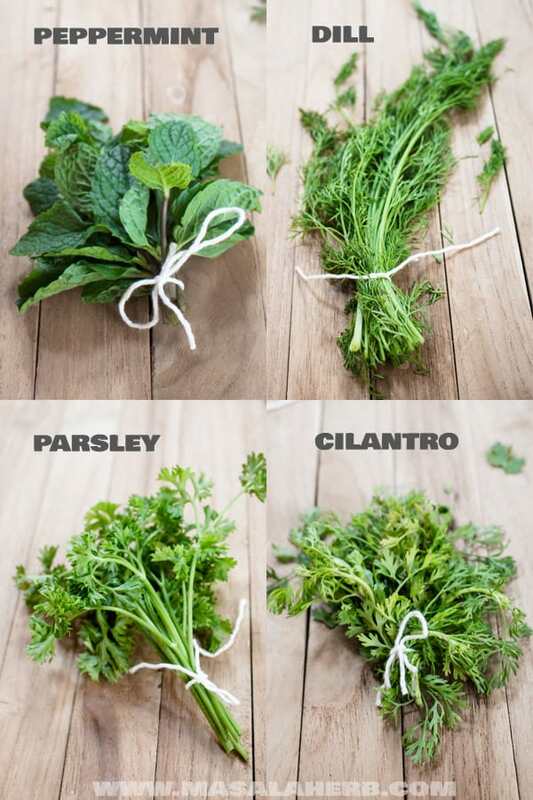 The fresh herbs in this salad make it extra delicious. Mint and dill rock this salad. Just Pinned! Combination of cucumber, tomatoes, onions and herbs is one of my all time favorites. And the simple dressing of lemon and olive oil is all this salad needs. Wonderful. Such a light and refreshing salad! I love all the background information you provided. I can’t wait to try this. This looks so lovely and I love all the herbs in there! I would appreciate if you could help me to prepare vegetables pulao a detailed recipe I don’t have any idea how to dry water in pulao. Thanks for your time and advice in advance. Awaiting your reply. Hi Joaquim, I am not a pulao specialized as I rarely cook it but I can give you the following tip. To reduce the water while cooking you need to make sure to not add too much water to the rice while cooking. All that depends too on what rice variation you use. If you use basmati, it would take a shorter cooking time and less water. The rule of thumb with cooking such rice without it getting too soggy is to use a ratio of 1:2. So if you have 1 cup of rice add 2 cups of water. Then, of course, you can add your spices and vegetables to prepare vegetable pulao. Currently, I hadn’ t planned anytime soon to post vegetable pulao here. I have a short old pulao recipe here besides the beef recipe in this post. This is the first time I’ve seen this salad and I can tell that I would love it with its fresh and flavourful herbs and tangy dressing. Very refreshing and I love its crunchiness too. 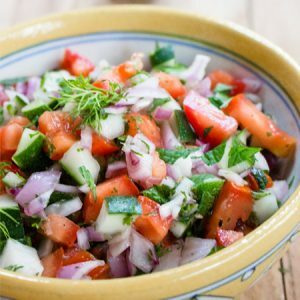 Hi, this may be interesting you: Easy Shirazi Salad Recipe!